Meher Baba called Agnes his “watchdog,” and she liked the term. She said, “All right. I’ll snap at the heels of the hypocrites.” Meher Baba also told Agnes, “Anything you say about Meher Mount is all right with Me.” He later repeated this statement in a letter sent by Adi K. Irani on Meher Baba’s behalf. AGNES BARON pointing the "white house," the carpenter's shed brought onto the property as a place to stay for the men mandali who were to accompany Avatar Meher Baba in 1952. In the summer of 1982, Bill Le Page visited Meher Mount from Australia. Bill had helped build Meher House in Sydney and Avatar’s Abode near Brisbane. Bill and Agnes got along well. He remembers talking with her in the living room of the guest house where Meher Baba had met with His followers in 1956. “I was intrigued with her early history and the keepsakes she had. I had some very nice times with her. I liked Agnes. I admired her strength of character that had kept her going despite all the issues she faced. What a wonderful Baba Lover she was,” he said. The subject always came around to what she should do with Meher Mount. “I wanted to help. We talked about the administrative structure for Meher Mount. She wanted to leave Meher Mount to humanity in general. Agnes wanted Meher Mount in a trust, but she did not want some of the Baba Lovers she had known to run the trust," he explained. WHAT TO DO WITH MEHER MOUNT? Bill felt that if Agnes talked with the mandali, “things would get sorted out.” She was particularly looking forward to speaking with Mani S. Irani, Meher Baba’s sister and head of the Avatar Meher Baba Perpetual Public Charitable Trust (AMBPPCT) in Ahmednagar, India, and with Eruch Jessawala, Meher Baba’s close disciple who for many years translated all Meher Baba’s gestures for the public. Agnes became dear friends with Mansari Desai, another of Meher Baba’s women disciples who was also described as Meher Baba’s “watchdog,” particularly for Meherabad Hill where His Tomb Shrine is located. Agnes later said she and Mansari enjoyed each other’s company. They would laugh and joke about their “bow-wows,” as they both kept and loved dogs. Mansari had been ordered by Meher Baba not to cross the railroad tracks at the bottom of Meherabad Hill where she lived near His Tomb-Shrine. Agnes said Mansari would walk her down the hill to the tracks, and Agnes would playfully act like she was going to pull Mansari across the tracks. Then they would laugh more. They corresponded the rest of their lives. Alan Wagner, a Western volunteer and resident, described meeting Agnes in 1952 in India. “I was sick with pneumonia and in my room for several days. Agnes came to my room and asked if she could do anything for me. “I thought about it, and realized that actually, I did. I needed to respond to someone who had written me. I had talked to Eruch about my response, and he had given me points on what to say. But still, I had procrastinated on my response." Alan says he felt he could trust Agnes with this letter, even though it was very personal. So, he dictated it to her. “She took it down in shorthand, then went to the office and typed it up. She came back with the typewritten letter. I signed it and sent it. “I remember her thoughtfulness and offer to help me, though Agnes hardly knew me, with fondness,” he said. The Beloved's Watchdog: Agnes Baron Remembers Her Life with Meher Baba is part of A Witness Series (TM) Video. It was recorded during Agnes' 1982 visit to Meherazad, India. Agnes had hoped that Meher Baba’s Trust (AMBPPCT) in India could directly take ownership of Meher Mount, but was told by the mandali that this would be legally and practically impossible. She was disappointed and continued to explore other options. 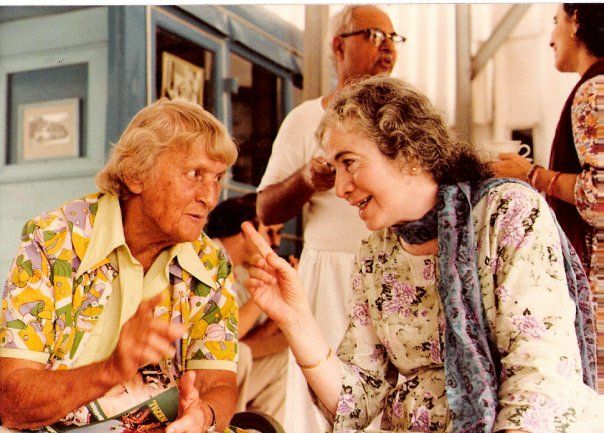 Seven years later in 1989 and working with Bing Heckman, a follower of Meher Baba and longtime volunteer at Meher Mount, Agnes she set up the non-profit, 501(c)3 organization, Meher Mount Corporation. She selected its first board of directors, which included both followers and non-followers of Meher Baba. She established a life trust that donated the 173-acre Meher Mount property to Meher Mount Corporation and that allowed her to live there for the rest of her life. Agnes died on July 5, 1994. The non-profit corporation continues to manage and support Meher Mount as a universal place of pilgrimage dedicated to Avatar Meher Baba. Meher Baba never arrived at Meher Mount on that trip due to an automobile accident in Prague, OK, on May 24, 1952. See “Meher Baba Sheds His Blood in America.” He later visited Meher Mount on August 2, 1956. All the keepsakes were later destroyed in the New Life Fire at Meher Mount on October 14, 1985. During that visit, Bill Le Page helped arrange for a recording of Agnes’ story as she told it in Mandali Hall in Meherazad. The recording, The Beloved’s Watchdog: Agnes Baron Remembers Her Life with Meher Baba. A Witness Series ™ Video, is available from Sheriar Books.